…..No more to say. And, on good authority, he ain’t ever going to do it again. So it is truly a once in a lifetime experience!" Jeffery Deaver is known for his twists and turns - and for challenging the reader to guess where he is going with these twists and turns before reaching the end. 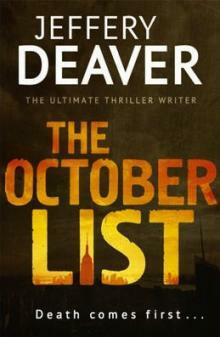 The October List is a thriller written backwards, so this time the race is on to beat him to the beginning! Deaver himself was surprised at the complications of writing the timeline backwards; there is no let-up on the tension, and there are no fewer twists because of it. There are clues to follow, if you can spot them, but as always with Deaver, the reveals are unexpected and shocking. Ch 36 6.30pm Is my daughter alright? Ch 35 5.50pm A killer waits. Ch 34 4.00pm Money & the October List. Ch 33 3.30pm It already is a bloodbath. Ch 32 3.15pm The cavalry has arrived. Ch 31 2.15pm GPS points to Gabriela. Ch 30 2.10pm At the Norwalk Fund flat. Ch 29 1.40pm Frank Walsh fantasises. Ch 28 1.00pm Joseph’s complicated night ahead. Ch 27 11.50am ‘Yellow Shirt’ wants to talk to them. Ch 25 11.10am Daniel, it’s time for you to leave. Ch 24 10.00am Was ‘shoot a cop’ Plan C? Ch 23 9.45am Enter Fred Stanford Chapman. Ch 22 9.30am Daniel gets it on with Gabriela. Ch 20 10.00pm ‘Yellow Shirt’ hears about the October List. Ch 19 8.30pm Waldorf Hotel:Daniel and Gabriela enjoy a snack. Ch 18 5.55pm Always there are penalties for being late! Ch 17 5.30pm It’s only a finger. Ch 16 4.50pm Seventy minutes left. Ch 15 3.15pm Put away for safekeeping. Ch 14 2.50pm That was no accident. Ch 13 12.30pm Once, twice…? She’s no lady. Ch 12 Noon Follow her and we will find Charles. Ch 11 11.15am I’ve got your daughter. Ch 10 10.30am Where's Charles Prescott and twenty five million? Ch 9 10.00am Two detectives come calling. Ch 8 9.00am Kosher does not mean low calories. Ch 7 10.00pm A boring three hours. Ch 6 6.30pm The Princeton Solution and a fast boat. Ch 5 5.00pm Paperwork and a spilt drink. Ch 4 1.30pm One way to handle money. Ch 3 12.20pm Frank Walsh is a nerd. Ch 2 11.00am She’s his office manager. Ch 1 8.20am Let me tell you what I need. Joseph – snatched Gabriela’s daughter Sarah, wants the October List and his money returned. Daniel – a man who can, among other things, help raise the ransom. Frank Walsh – obsessed, with Gabriela and her high-heeled shoes. ‘Yellow Shirt’ – ambitious low-life.